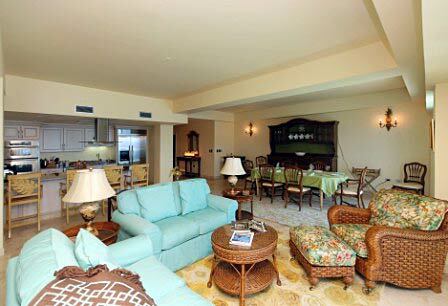 All Suites have a view of Ocean and suites from the 5th level and above have views of the Simpson Bay Lagoon, Anguilla, and French Lowlands (Basses Terres). 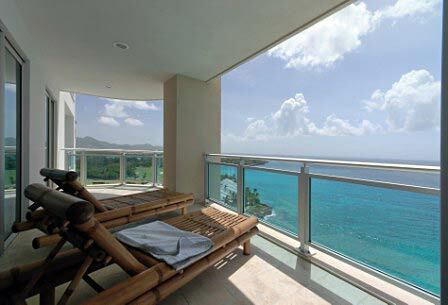 Each suite extends from the front to the back of the building guaranteeing spectacular views of the Caribbean Sea. Suites have oversized living and dining rooms for lounging and entertaining and have fully equipped kitchens with granite tops, stainless steal KitchenAid® appliances and all necessary utensils for preparing a gourmet meal. 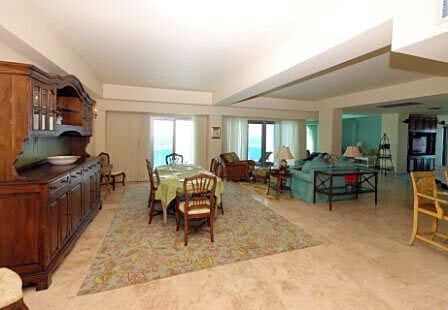 Each Suite has different bed configurations to suit every type of vacationer. Kings, Queens, and Doubles. When making your reservation our staff can help you find what's right for you to ensure a pleasant vacation. We can send you pictures of the actual unit you will be renting. Room Rates are based on occupancy of up to 8 persons with a minimum of four (4) night stay. Up to four (4) children stay free when staying with four (4) paying adults. Square Footage: 4485 square foot (416.6 square meter). 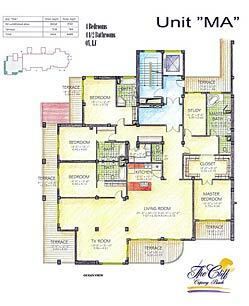 View the Floorplan.